It's not secret that what you end up receiving in life is an ultimate indication of what you've been giving. If the majority of your time has been solely you trying to receive from others and you seeing what you can get out of something or someone, you're doing it all wrong. It may work for you in the beginning but let's not forget how the law of attraction works and how eventually it'll all catch up to you. Despite our unwillingness to be vulnerable and be extra giving, it's something we should definitely practice. My thought process on it is, if I give too much, I'll end up being rewarded anyway (whether I am jaded or not.) And if I choose not to give enough simply because I think someone doesn't deserve it or I am afraid, I'll end up losing and getting that same treatment back. You see, we need more people who aren't afraid to give it their all. We have too many hard hearts out there let's change it up. If you want something in your life, you have to be deserving of it. It doesn't just appear in your life because you want it. You have to show the universe why you deserve it and works towards it in the way that you would earn it. 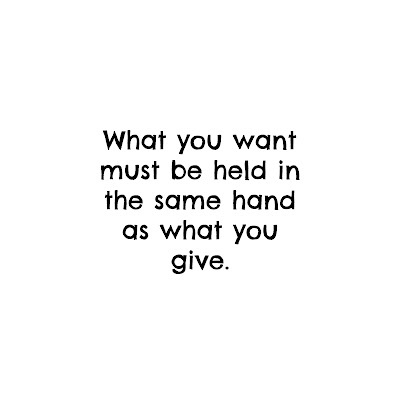 You have to give to receive. And as hypocritical as it sounds, you can't give with the thought in mind of what you're going to get in return, you have to give because it's what's needed and it's what's right. Give because the world needs more of it and because eventually, you'll receive what you deserve because of how selflessly giving you've been. You'll only get what you put forth. this is the most deep post ever.... love it girl. thank you for this. This is so true! I love reading your motivational posts. They really get you pumped for the upcoming week.